As a time-traveler, I'm as interested in the future as I am of the past. And if you want to predict what will happen in the future in Phoenix, all you have to do is understand its past. Personally, I'm not interested in investing. But if you are, I think that I can help. Because Phoenix has been doing the same thing over and over and over since 1870. And since you're an investor, I'd like you to take a look at people who took some big risks, like Jack Swilling, or Dwight Heard. If you've never heard of these people, that's where you should start - they created Phoenix, Arizona. They looked at nothing but dust and dirt and imagined a city. I call these kinds of people "unrealistically optimistic". You may want to learn about William Murphy, who decided to dig a canal in 1885 all of the way from north of where Apache Junction is now to the Agua Fria River, which is west of Peoria. It was a privately-funded canal, dug by hand. Well, they had mules, too! If you're not impressed with him, take a look at a guy named Del Webb who bought a ghost town northwest of Phoenix in the 1950s called Marinette and built a city dedicated to retirees called "Sun City". And then there's my favorite lunatic, a crazy guy named Walter Bimsom who took over Valley National Bank of Arizona after the depression, and decided to make loans - lots of loans. Phoenix exploded in growth after World War II, most of it on Valley Bank Loans. The list of these types of people in Phoenix goes and on, and when you get to Charlie Keating in the 1980s, you need to stop and double-check your morality. My point here is that the future of Phoenix belongs to people willing to invest. It belongs to people who will stand up and create something, risk it all, not people who just sit on the sidelines and wonder "what happened?" Like I say, I'm not investing. I can't imagine standing in an empty desert in 1868 with Jack Swilling and helping him dig a canal. If Dwight Heard had given me a bargain price on some dusty desert land north of downtown Phoenix in 1911 I would have laughed at him. If Del Webb had offered to let me in on the "ground floor" of his lunatic scheme of "Sun City" in the 1950s I would have walked away, and if Walter Bimson had offered me a loan after World War II, I would have said, politely, no thank you. I certainly wouldn't have given any money to Charlie Keating! So there you go. I'd say if people aren't laughing at your "unrealistically optimistic" ideas then I'd say you're not thinking big enough. If you take the time to look into the past of Phoenix you'll see it didn't happen by accident, it happened with the kind of vision that makes me wonder "what were these guys thinking?" 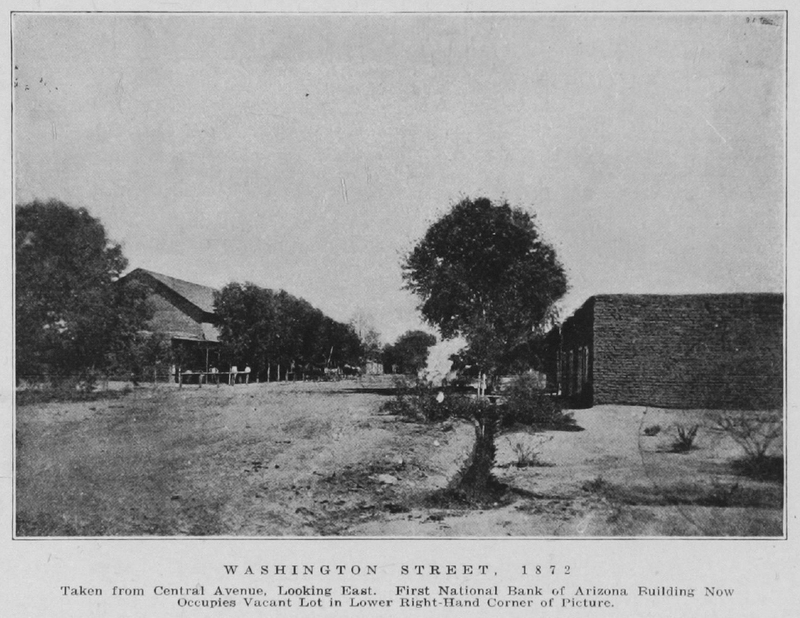 Image at the top of this post: Looking east on Washington at Central in 1872. You could have bought a lot there for just a few dollars, and people would thought you were crazy.